Great news! We will be releasing our brand new Mystery Box today, but before we do, we are giving you a head start on spreading the official news. 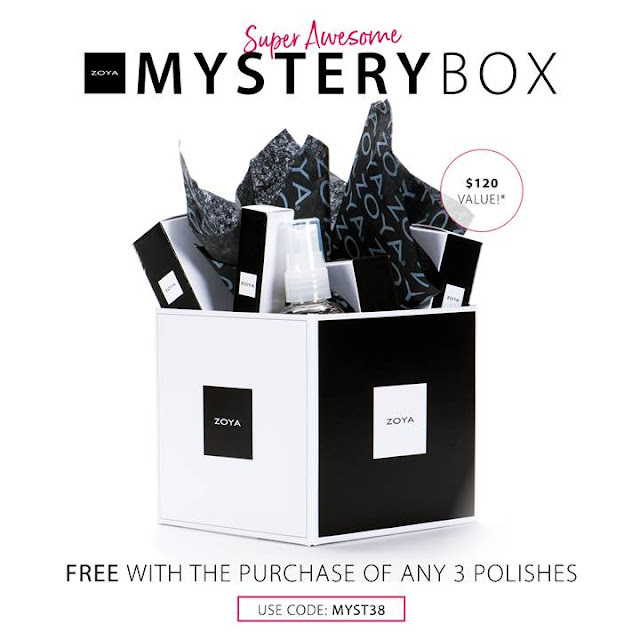 Now – 1/26/18 (11:59pm ET), Purchase any 3 nail polish colors, and receive the Super Awesome Mystery Box FREE*, PLUS get Free Shipping. We can't tell you what's inside...but we can tell you it's AWESOME. The box has a $120 retail value in products PLUS special offers and coupons inside. Just add your 3 colors of choice to the cart, and Use Code: MYST38 at checkout. The Mystery Box will be added automatically, and will be available to purchase until 1/26/18 (11:59pm ET) OR While Supplies Last – when they’re gone, they’re gone! Shipping will begin on 1/26/18 and is available to US and Canada Consumers Only – Limit 1 per Account.